Detroit Community Schools, a charter school located in a low-income, underserved corner of the city, will have to repay the state $144,000 after the school illegally employed two administrators who are unlicensed. The Michigan Department of Education found that Detroit Community Schools violated state licensing law last school year because it employed Sharon McPhail, a former city attorney and city councilwoman, as its superintendent since 2012, and employed Eschelle Jordan, as the high school principal, while both women were unlicensed. State law requires a superintendent, principal, assistant principal, administrator of instructional programs or chief business official to be certified. In an interview last spring with Bridge, McPhail said her superintendent title had changed to chief administrative officer and therefore, she did not need to be certified. In a penalty letter dated Aug. 1, the state disagreed. McPhail’s title at the school changed on the school’s website from superintendent to “chief administrative officer” in March, after Bridge first started asking questions of the school. However, McPhail was still required to be certified because “a change in title did not substantiate the change in responsibility or role,” the state wrote. MDE decided to investigate four administrators at the school after a story in Bridge revealed in April that some top administrators were not certified. Sharon McPhail, a former Detroit city councilwoman and former general counsel for the city, has defended the hiring and certification practices of Detroit Community Schools, which she has headed since 2012. Under a 2015 law, schools that are found to violate administrator certification law must repay the state for the salary paid during the time the employee worked without certification.The charter school was ordered to repay the state $87,260 of the $130,000 salary paid to McPhail from October 2015 to June 2016; and $57,054 of the $85,000 salary the state said was illegally paid to Jordan. MDE found that the chief financial officer at the school, William F. Coleman III, former superintendent for the Detroit Public Schools, and another administrator, Wajih Hakim, are not required to be certified. Their employment is in compliance with state law, the state said. 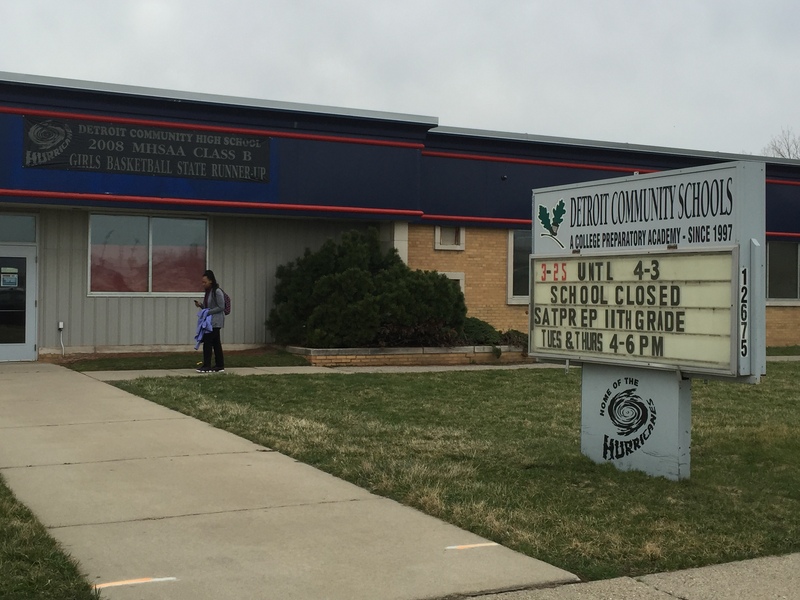 Detroit Community Schools is a charter school in the Brightmoor neighborhood on Detroit’s west side. It educates about 800 students in elementary through high school and is the only high school serving the 7,000 school children in the neighborhood. It has struggled academically since its inception in 1997. As Bridge previously reported, of the 1,053 students who took the ACT tests since the high school first offered it in 2006-2007, only two have met the college-ready standard in all tested subjects. At least two of the administrators at the school have had legal troubles involving malfeasance. Coleman was also indicted as part of a Texas bribery scandal in Dallas where he once worked. But he was allowed to plead guilty in 2008 to a reduced charge of attempting to influence a grand jury in return for testifying for the federal government, court records show. As a result, prosecutors also agreed to drop conspiracy, bribery, money laundering and obstruction of justice charges against Coleman in the kickback scheme, which the government valued at roughly $40 million. The school’s dean is Sylvia James, a former judge. In 2012, the Michigan Judicial Tenure Commission recommended James be removed from the district court bench in Inkster, near Detroit, for misusing court funds. The Michigan Supreme Court upheld that recommendation and removed James, finding that James “made numerous misrepresentations of fact” to the Judicial Tenure Commission, employed her niece against court rules and misappropriated funds intended for the court’s Community Service Program, including money that was supposed to go to crime victims and the elderly in Inkster. She has since filed a lawsuit challenging that ruling. The school's charter contract is authorized by Bay Mills Community College, located in Brimley in the Upper Peninsula. Michael Parish, who heads the Bay Mills Community College charter school office, could not be reached Thursday to comment on the fines. The MDE penalty letter was addressed to Richard Robinson, the school's board president last school year. His term ended June 30, according to the school's website. McPhail, and three other members of the charter school's board, also did not respond to Bridge inquiries. According to the state, MDE’s findings mean the school can no longer employ McPhail and Jordan as administrators until they are properly certified. "State law prohibits the continued employment of a non-certified individual as a school administrator," William DiSessa, a spokesman for MDE, wrote in an email to Bridge. Further, he said, the school cannot circumvent the law by firing and then rehiring them in an interim or temporary administrative position - a tactic used by some schools in the past to avoid rules that allow administrators to begin the certification process within six months of being hired. If a school official continues to employ administrators after having been notified that the administrators are unlicensed, then the official will be guilty of a misdemeanor punishable by $1,500 per offense, according to the MDE. Good work Chastity and good work Bridge Magazine. Excellent. Look for the state legislature to introduce bills allowing or exempting fines for the practice. Let's make sure the State fines charter schools for such very questionable activity and enforces the rules. I thought such behind the scenes wheeling and dealing and personal enrichment at the expense of the kids so prevalent in big City school districts was what charter schools were trying to avoid. Seems like just more of the same and points to the need for more oversight of charter schools not less. Does the State Board Of Ed have a responsibility to check on these credentials. Only two students passed the ACT for college since 2006? That should have been a red flag a long time ago if anyone cared. Saginaw Valley State University, the original charter authorizer of Detroit Community Schools, tried to close them down at the end of the 2013-14 (?) school year for unrelentingly poor academic performance. But the well-connected Sharon McPhail was able to get a new charter from Bay Mills Community College by special pleading that there is no other high school physically located in Detroit's Brightmoor neighborhood. It's not fair to say that "nobody" cares about this failing charter school; but too many people in Michigan's educational establishment care more about the appearances of shutting down a school run by long-time Detroit Democratic machine politicians than they do about how much the students are learning or how much taxpayer money is being wasted. Bless the press. Or in this case, the Bridge. No doubt politics is involved since McPhail at one point was Kwame "The Felon" Kilpatrick's lapdog and probably still is. Doesn't mean we elect mistakes like Trump and then sit back but that we follow up and hold people accountable. Trump says crazy and stupid things and voters mistakenly believe that by voting for him they are "doing something to fix the problem" when in fact they are letting their anger get the best of them and are really making things worse. This is a story that Bridge Magazine most definitely should continue to follow. Trump has a long, stellar history of lying. From seeing Muslims cheering in New Jersey on 9/11 (before anyone knew that Al-Qaeda was responsible) to viewing a non-existent video on loading cash for shipment to Iran. He's SO wealthy, but won't release his tax returns (Hillary has) and reveal that he may not have paid any taxes. And let''s not even talk about TGrump University. How does this uncertification even happen is my question. If there is a letter that states certification is required then there should be a paper trail started so a letter to uphold is practically unnecessary. Very disappointing and like Barb said what is being done about 2 in 1053 college ready status? Unscrupulous people is one thing but educating our kids is obviously the mission to be accomplished. This is Brightmoor, not Detroit. Obviously, these criminal minds do not care about educating children. They are just about lining their pockets. This doesn't do much to the perpetrators. The fine takes money from students when it should come from the officials involved. None the less, this is a good decision. Sharon McPhail has been stealing for years. How does one school afford all these huge salaries anyways? NY Times had a good feature recently on the ridiculous amount of charters that have opened in Detroit recently despite the exodus of residents "A Sea of Charter Schools in Detroit Leaves Students Adrift"
But you can create legislation that allows for uncertified teachers in Detroit Publicv Schools? I am no fan of Ms. McPhail but isn't this a contradiction? Legislation statewide already allows for "uncertified" teachers in classrooms as either long-term subs or in an "emergency". The superintendent of the school that wants to hire someone must claim that no certified teacher is available for that position, and that the individual is otherwise qualified /certified to teach the subject. Right now their are at least 15 or 20 uncertified teachers of Mandarin and a handful of career education teachers often mechanics / construction trades) in school districts all across the state, because Michigan requires an education degree (or some masters classes) to get a teaching license and there are extremely few people with education degrees qualified to teach those subjects.